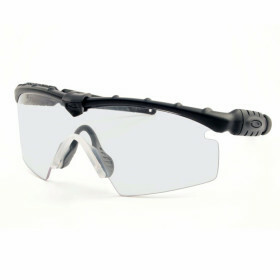 Oakley SI Ballistic M-Frame 2.0 Strike (Blk/Clear) » Protective Solutions, Inc. The Oakley SI Ballistic M-Frame 2.0 surpasses ANSI Z87.1 Industrial Standards for high-mass and high-velocity impact protection. The M-Frame 2.0 additionally meets MIL SPEC MIL-PRF 31013. All lenses are made of pure Plutonite®, a proprietary material that offers the highest level of optical clarity available in eyewear. It also features a clip that holds the lens and frame together providing more secure support.